We’ve all heard a lot about Elon Musk and the future plans of his companies, particularly that of SpaceX, in recent times. For example, SpaceX’s next generation is reportedly going to bring extraterrestrial travel – and maybe even colonisation – to the masses in the next decade. Tesla, on the other hand, may have more down-to-earth goals. It has been clear for some time that the electric vehicle manufacturers are going to move into the large-scale logistics space; they intend to release an electric truck – what would be termed a semi-trailer truck in Tesla’s native United States. This truck combines typical features of the modern-day truck (for example, a flat face) with more high-tech accents – it has an extremely streamlined appearance, in addition to an imposing-looking line of LEDs along the top of its windshield and dramatic, exaggerated headlights. Tesla is adamant that their foray into the road-cargo space makes economical and business sense. However, we will have to wait until the end of this month (October 2017) to make sure of this for ourselves. The Tesla semi-truck (which still lacks an official model name) has only been seen in approved corporate images and mock-ups. However, a vehicle that may be the real live electric truck has surfaced in leaks posted on Reddit this week. This image, in which the truck rests on the flat-bed of a conventional semi-truck on what may be a loading space under the California sun, matches well with the official head-on release. The truck has a silver body surmounted with the aforementioned front glass panels, a ‘sunroof’ and side windows, which are all made of darkly-tinted glass. Like most semis, the truck itself consists of the cab trailing two smallish wheels, at which point a load will be attached. To the left of the image, behind the truck, is a blocky, regular shape with a back-curved front. This item matches well with the fairing the Tesla semi is supposed to be equipped with; it is mounted on top of the cab to improve airflow and aerodynamics. A photoshopping experiment (also posted on reddit) revealed that the object in the picture does in fact appear to fit on top of the ‘semi-truck’ in the leaked image. All in all, the new images look convincingly like the promised electric Tesla truck. However, it does not clarify some other issues that many interested parties might have about the new vehicle. There are many in the commercial vehicle industry that may be sceptical about this ‘new generation’ of semi-trucks, particularly in regards to its ability to keep up with others fueled from conventional sources. However, Tesla claims that their semi-truck has a range of 200 to 300 miles with a full payload. Therefore, the truck may be perfectly capable of haulage as a ‘normal’ semi would – but only over what would be considered a ‘regional’ area in U.S. terms. (On the other hand, this range would be perfectly amenable in smaller countries such as Ireland.) The new truck model also lacks a sleeping area, which is common in most “big rigs”, the drivers of which are expected to conduct haulage trips that last several days and bring them across significant proportions of the North American continent. Therefore, the Tesla truck would only be able to handle 30% (at the most) of all the trucking business for this country. 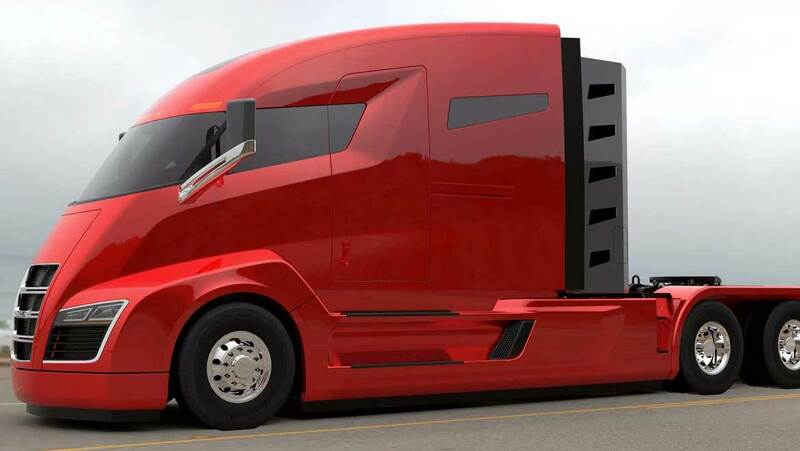 Tesla has also had to design a new line of large-capacity batteries for the truck, which could cost at least $120,000, according to researchers in this area based at Carnegie Mellon University. However, Elon Musk’s e-vehicle company are confident that their truck project is economically viable. They are basing this on observations that they could save up to 70% on expenses such as the maintenance of, insurance for and of course fuelling the vehicles. However, this projection does not take some pertinent factors, such as technician training for the (probably unique) needs of the new electric truck, into consideration. In addition, Morgan Stanley estimates that Tesla will need to hit certain targets, such as selling 25,000 units in the semi’s first year of release, to make this new project a financial success. This may be just the beginning of an interesting month for Tesla and those interested in the company’s evolution and fortunes. The success of their new “electric semi” could inform the applications of ‘green vehicles’ and how they might expand in the near future. This latest Tesla project should be officially unveiled on the 26th of October, according to a series of tweets on the subject from the company’s CEO. It will be interesting to see how well the electric regional hauler will compete against existing vehicles that do the same job.